Roxy Blue releases new EP “Raw” | Sonic Smash-Music! 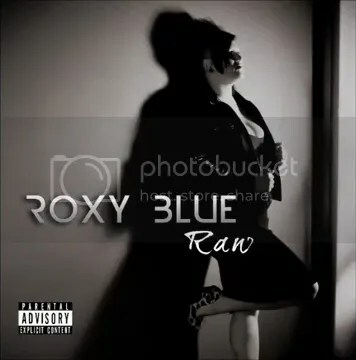 The high-octane chanteuse known as Roxy Blue has released her debut EP on Hit Nation Records, titled, “Raw.” The EP is a shocking revelation to many fans of the singer-songwriter genre, as there are few – if indeed any – performers like Roxy Blue in the underground music scene today. Her album is marked with the same “Parental Advisory – Explicit Lyrics” sticker that got Guns ‘n’ Roses banned from K-Marts in 1987, but Roxy Blue wears the tag proudly for entirely different reasons. “Slap on a ‘warning’ sticker, ’cause no-one knows the dangers of a little girl,” she declares in the EP’s opening track, “Warning.” Unlike the words to famous G ‘n’ R songs, Roxy’s lyrics are the literal definition of ‘explicit’: clear and concise. Her impeccable singing voice has the strength and tone of Aretha Franklin, balanced with the modern edginess of artists like Ani DiFranco and Fiona Apple. Peaches also comes to mind, though Roxy Blue’s equally outspoken demeanor is also somehow classier. In addition to being one of modern music’s most stunning young vocal performers, Roxy is also a viciously capable poet with a personality ten miles high. She is rapaciously intelligent, and shockingly fearless. When her band was robbed at gun-point, they continued their So. Cal. tour as if nothing had happened. When she was hospitalized from a deadly car accident, she continued the studio recording of her single in a neck brace, despite doctors’ cautions that movements associated with singing could easily cause permanent, critical damage to her spine. “She sounded perfect, like the Roxy we all love,” a Hit Nation Records rep said. The “Raw” EP is a blend of modern blues rock and jazz. An a-cappella version of Roxy’s “Warning” is also available for listening online, showcasing her innate, staggering talent at the mic without unnecessary accompaniment. Roxy Blue’s EP “Raw” is available online everywhere beginning April of 2013. This entry was tagged mondotunes, roxy blue.